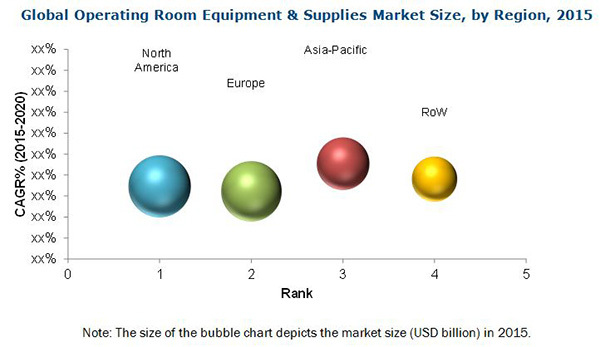 According to the new market research report \“Operating Room Equipment Market by Equipment (Anesthesia Machines, Operating Tables), by Supplies (Surgical Instruments, Disposable Materials), & by End-User (Hospitals, Outpatient Facilities) – Analysis & Global Forecast to 2020\“, published by MarketsandMarkets?, analyzes and studies the major market drivers, restraints/challenges, and opportunities in North America, Europe, Asia-Pacific, and the Rest of the world (RoW). In the coming years, the market is expected to witness the highest growth rate in the Asia-Pacific region. The high growth in the region can be attributed to growing number of hospitals in Asia, increasing number of German-Asian partnerships in Asia, government initiatives to increase the number of doctors in China, Japans growing healthcare industry, government funding in India, favorable healthcare system and conferences in Australia, increasing medical tourism in Thailand and Singapore, and increasing government investments in Philippines among others. North America is expected to account for the largest share of the global market. North Americas leadership in the market can be attributed to the investments by hospitals to upgrade operating rooms; rising number of surgical procedures; increasing number of ambulatory surgery centers; and increasing prevalence of cardiovascular disease in the U.S. In Canada, market growth is mainly driven by rising public and private investments, implementation of a new funding model for Canadian hospitals, and conferences on operating room equipment and supplies.